Okay I hate these Internet popularity contests. They don't really prove anything except for who can get the most friends & families to vote for their cause. 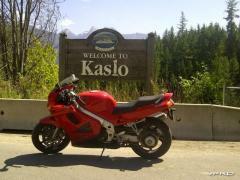 Here is the link to vote for Kaslo as Canada's Most Rider Friendly Community: http://riderfriendlycontest.ca/index.php/voting-dashboard. You have to register and you can only vote once per day. The second round of voting to whittle the number from 6 to 2 ends March 22. Kaslo is currently in first place with New Denver close behind. After that it's a distant third to the remaining field of Moncton, NB, Digby, NS, Liskeard, Ont, and Two Hills, AB (who haven't even received a single vote as of this time). This contest entry is a push back against a petition circulating in town and the regional district to crack down on loud motorcycles asking for the police to enforce the existing noise laws more strictly. I'm not a fan of loud pipes either and believe that motorcycle riders can enjoy the riding experience without having to be loud about it. I prefer the stealth of my stock exhaust though right now it's got an exhaust leak and sounding very un-Hondalike. What has a popularity contest to do with the price of milk? You write you are not a fan of loud pipes, but would you make a stand against it? Like a petition "motorcyclists in favor of stricter noise law enforcement/weed out the excesses"? As for the petition at hand, does it state verifiable FACTS (ie which independent body did the measurement of number and decibel infringements?) or is it a "Donald" saying that Mexicans and Muslims are evil people? The police should allocate manpower on facts or are the elected into office by the town folks? Asking the police to look into this is a fair thing to do. PS: I have -with a few others- successfully argued with local authorities 5 miles up the road to NOT close of a nice windy dyke road. This was done using the legal/formal tools available to me. If you want, we can PM about this. But you said you hate them and they prove nothing, then you want people to vote anyway. Of course this proves nothing, this is a town of 1000 people. Even if they did win it wouldn't mean it's more friendly than any other town. Why do people single out loud bikes, and not loud commercial trucks for example? Certainly loud bikes are a nuisance but loud trucks outnumber us by quite a bit. Turbo diesels with drivers Jake Braking on hills is rather annoying, where are the petitions on that? If they are going to circulate a petition how about loud vehicles in general. The beat up mitsubishi eclipse with the hole in the muffler and chicken wire on the licence plate should be included in that too. All it takes is a single person complaining to a single town Councillor and a single reporter getting hold of the story. At that point all truth and sensibility goes out the window and the crusade begins. I think the singling out of any one group of vehicles is not an appropriate way to handle this but we see it all the time. I think the difference between how (some, not all) motorcyclist conduct themselves on the road seems to way out number the way other loud vehicle drivers do. Excessive revving of their engines, blasting their radios so they can hear it above the engine noise and through their helmets, taking off at a stop light like their trying to get the hole shot, riding in packs with their engines at their fullest levels. This is what causes most people to single motorcyclist out, not the fact that anyone vehicle could actually be louder than city ordinance allows. Being in So Cal and frequenting most of the local riding spots and haunts, I see it all of the time, the macho attitude of showing others how bad a$$ their ride is and sounds, how well they can handle that much horse power and no care of others noise comfort, it's no wonder why motorcyclist get singled out every time. It's also no wonder that in some areas the local residence are taking matters in their own hands! As far as the OP's request for voting, it appears you have to sign in to be able to vote, is that accurate? We have a town close by that checks noise going through it on every Friday the 13th on the way to the infamous Port Dover and they write a huge number of tickets . I will only go there with the stock exhaust on the VFR . It never seems to amaze me how loud some of these other bikes can be and very hard on the ears ,particularly cruiser types which seem the most common for ear pain . I have voted for the Op in their town as the best but any day riding is always a great day .